I’ve been holding in some happy news for a couple weeks and am bursting to let it out! Today’s the day. I’m so excited and honoured to be heading into my third year as a Chicken Farmers of Canada Brand Ambassador! I’ve loved working with the CFC over the past few years through sharing yummy recipes, participating in fun Twitter chats and parties and sharing important and helpful information about Canadian chicken. We love Canadian chicken! The Chicken Farmers of Canada represents 2,700 chicken farmers of all types (like conventional farmers and organic farmers, etc) across the country. Their goal is to ensure that Canadian chicken farmers “produce the right amount of fresh, safe and high-quality chicken to meet Canada’s needs”. It’s no surprise to me that 80% of Canadians want an easy way to identify chicken that has been raised by a registered Canadian chicken farmer. I do, too! 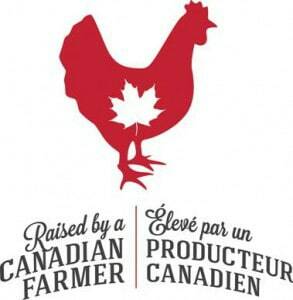 The “Raised by a Canadian Farmer” label tells consumers that the chicken they are buying is Canadian and is subject to the required programming for food safety and animal care. Look for this mark on products at your local grocery store. If you don’t see it, your store may not use it. Consider asking them to add it to their chicken so consumers will know. If retailers see that it matters to their customers, they may decide to act and deliver to meet the demand. And now it’s time to get into the meat of things. The recipe! You better prepare for a flavour explosion. This recipe proves that you can make a healthy, tasty meal without the guilt. There’s no extra sugar or fat and this recipe consists of protein, veggies and spices. Protein is an important part of how I manage my weight. I lost over 50 lbs by following a low carb diet. I ate lots of fresh veggies and fruits, healthy protein sources like chicken, whole grains and dairy. With the new year upon us now, I feel renewed to include more healthy meals in our meal rotation like this one I’m sharing today. At first, I wasn’t sure what to call it. Chicken Fiesta? Mexican Chicken? I settled on Spicy Pepper Chicken since I think this describes it best. It has four peppers and is spicy because of the addition of Serrano peppers and chili powder. I debated topping it with melted cheese, but left it off to lower the fat content. Word to the wise. Grab a pair of kitchen gloves when you are chopping the Serrano peppers and cleaning up the seeds. They are HOT! You don’t want to touch your skin or eyes after handling these guys. It burns. The chicken bakes in the peppers and sauce in the oven which allows the flavours to infuse into the meat. It’s a bit like braising minus the searing of the meat first. You won’t even see the chicken breasts after you add in all the ingredients to your casserole dish. I always check my temperatures with a meat thermometer. I did this at the one hour mark and I wasn’t quite there yet so I let it cook a little longer. John likes to check by cutting into the chicken to look, but I much prefer to use a thermometer. Then I’m not mangling the chicken. This recipe could easily turn into a slow cooker recipe. I’d prepare it the same way, but keep it on low for 6 to 8 hours and checking for doneness with the meat thermometer. Make it a meal by serving with rice. You’ll have lots of extra sauce to mix in with the rice. I kept mine low carb so I didn’t make any. Another thing I wanted to mention is that you can omit the Serrano pepper if your family isn’t into spices. It will still taste great without it. My kids like spicy foods so it’s not really an issue for me, but I have friends who would need to take it out for their brood to eat it. For more healthy (and yummy!) recipes, make sure to check out the recipes on Chicken Farmers of Canada website. You can search recipes based on category or dietary need. They are one of my go-to sources of meal inspiration! What is your favourite healthy chicken recipe? Prepare for an explosion of flavour! 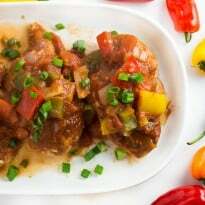 This healthy and mouthwatering chicken recipe has four types of peppers plus spices. Enjoy this meal without the guilt. Preheat oven to 375F. Place chicken breasts in a casserole dish. Mix together chili powder and salt and sprinkle over top of chicken breasts. Spread onions and peppers over the chicken breasts. In a medium sized bowl, mix together diced tomatoes, tomato paste, green chilies, salsa, garlic and cumin. Pour over the chicken breasts. Cover loosely with tin foil. Bake for 1 hour. Remove from oven and stir and check chicken for doneness with a meat thermometer. Cook an additional 10 to 15 minutes, if needed. To serve, spoon extra sauce over top of chicken. Top with green onions, if desired. That chicken sounds awesome. We love meals like this in our house, so I will definitely be trying this. This recipe looks amazing! Makes me want to eat this meal right off the computer screen. I will have to add this to our menu planning next month. We eat a lot of chicken at our house and I’m always looking for different ways to cook it! 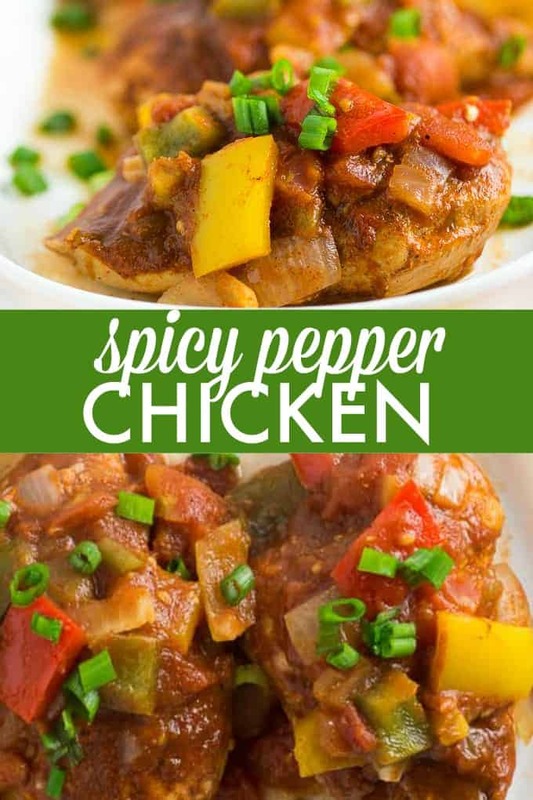 My husband would love this recipe – especially the spicy factor! Yummy! I’m starting to love spicy foods as I get older! This looks like something my husband would love, too! Loving it, all the peppers make this very special! Congrats. They couldn’t have chosen a better ambassador, your food is amazing and I look forward to more chicken posts. My family LOVES chicken! This looks amazing! this looks totally delic. i can almost taste it. lol. those peppers remind me of my granny. she used to cook with them all the time. Oh this sounds delicious. I’d love to start making more healthy chicken recipes like this. This looks great. My husband loves spicy stuff. I’ll have to make it and see if he likes it. This looks yummy. I am always on the look out for more ways to serve chicken. I am bookmarking this recipe. oh yeah I can see my husband just killing this!! I dont “DO” spicy food but he absolutely lives for it. This chicken dish sounds so tasty! Congrats on your third year! It looks super yummy! Congrats on your 3rd year as ambassador. Stopping by from Wonderful Wednesday blog hop. 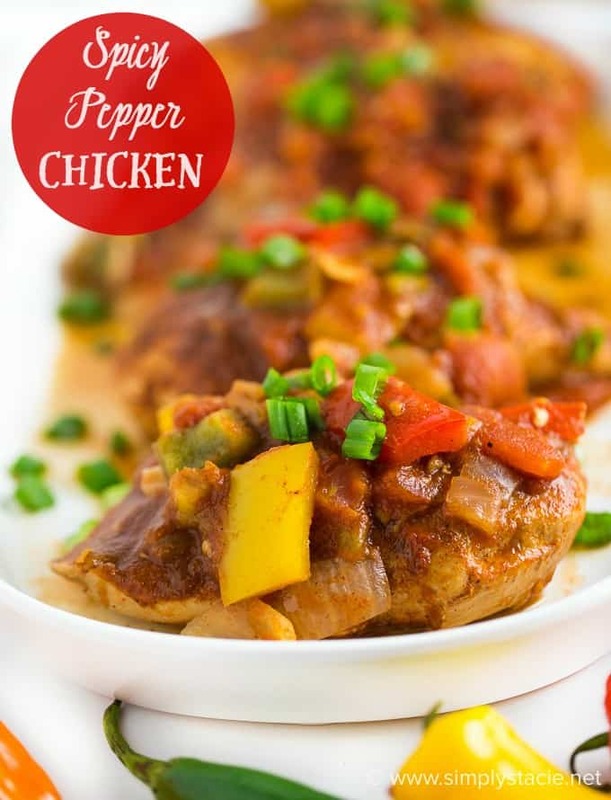 Love that you just used ALL the peppers in this chicken recipe 🙂 Bring on a bit of heat – I’m all for it! And this looks super easy and perfect for a weeknight dinner. Yum! Looks so delicious. I’m all about spicy foods. Pinned & shared. Thanks for joining in the Inspiration Spotlight party! Have a great weekend. 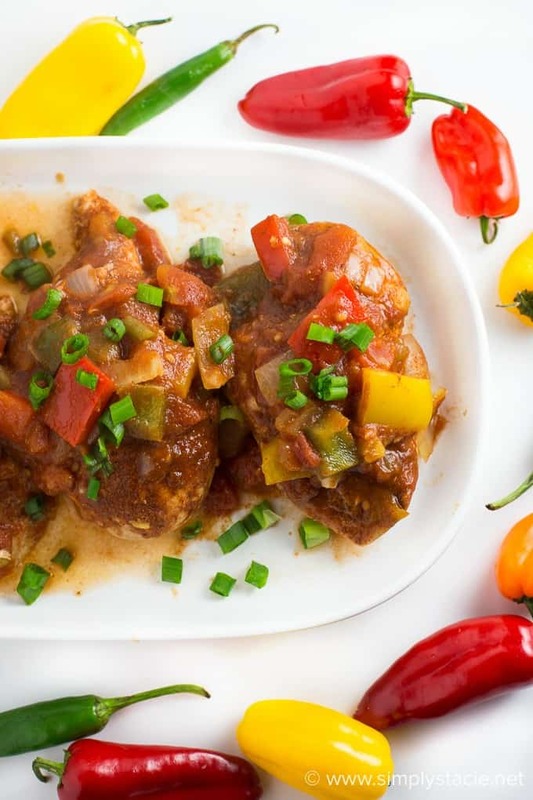 Your Spicy Pepper Chicken will be awesome, can’t wait to try it! Thanks so much for sharing with us at Full Plate Thursday and hope to see you again real soon!